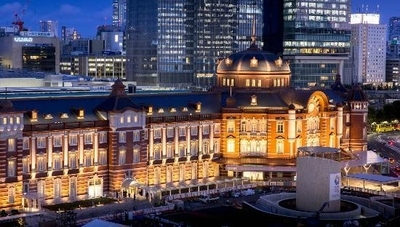 After a multimillion-dollar overhaul, the Tokyo Station Hotel—located in a train terminal that dates back to 1914—still holds on to a few historic secrets. In the center of the world's most populous metropolis, the Tokyo Station Hotel stands out for what it isn't: a gleaming skyscraper, a funky architectural wonder, or a blocky mid-rise. Located inside a 1914 red brick train station—one of the few buildings to survive Tokyo's 1923 earthquake, World War II firebombing, and relentless postwar reconstruction—this deluxe 150-room hotel has reopened recently after a $625 million renovation. The team tasked with updating the look was London-based Richmond International, which had modernized the Trianon Palace Hotel at Versailles and the Four Seasons Gresham Palace in Budapest before taking the Tokyo job. "We wanted to retain the Queen Anne style as a reference to the history," says Richmond principal Fiona Thompson. 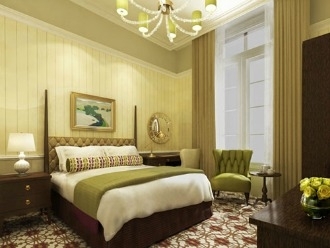 But the Tokyo Station Hotel is no relic. It's drenched in contemporary colors – yellows, purples, light greens and blues, softened by creamy beiges. "We wanted them to be up-to-date, to be fresh and clean and bright," said Thompson. The bright, high-ceilinged, wide-windowed rooms are outfitted with dark woods and glass chandeliers. The furniture has been designed for modern living; for example, the beds have padded headboards perfect for nighttime reading. The feel is English manor house, but in a bustling city. The spacious bathrooms and high-tech amenities (flat-screen TVs, WiFi, and Japanese toilets, with seat-warmers and choice of waterjet) are also smart. On the outside, the 1,100-foot-long double-domed exterior was restored to its original appearance, except for the addition of a rooftop atrium that serves as a breakfast room. Sharp-eyed visitors will spot flashes of red in the atrium, hallways, and suites. "We wanted to expose some of the original brickwork so people could see the bones of the building," Thompson says. The rooms and public areas overlooking the domes provide entertainment in themselves. Look up to see yellow octagonal ceilings studded with stone reliefs of various birds, or glance down for what Thompson calls "the theater of the station": commuters, tourists, and locals using the building for its original purpose. "It's a unique, traditional and classical spot in Tokyo. It's a bustling place," she added. And there's one secret the hotel has kept for close to a century: an entrance reserved for the imperial family. It's located to the left of the hotel lobby, but even most staffers are forbidden to use it.